Customers: Ultimate goal of migration is provide better experience of purchase on your website for new as well as old customers. You must need to migrate your old customer data in such a way that they do not need to re-register on your website but can easily login with their old password. In major cases, customer’s password cannot be copied in new platform as each platform handles password differently. In such case, you require to implement an easy way allowing customer to reset their passwords. Products/Category: Just like customer, Products, their attributes and categories data requires proper migration on the new platform along with their images and inventory. Sales History: Migrating old sales history is normally ignored by store owner as its technically difficult if it’s not handle properly. If possible, try to migrate sales history so it helps you to compare your sales performance over a period of time and also your existing customers do not get surprised by missing their previous orders in their dashboard. For proper data migration, you must need expert ecommerce development company having strong experience over it. If you are migrating from opencart to Magento or osCommerce to Magento, using 3rd party services can be cost effective, but for complex migration like NopCommerce to Magento or BigCommerce to Magento, We always recommend to hire expert Magento developers who are familiar with various migration tools and extensions. You should take important consideration to your landing pages URL that will have been cached by the search engines and ultimately that have built up a wealth of authority. You need to try to have same old URLs for products, categories and CMS pages on new platform. In worst case, if URLs are changed, you need proper 301 redirection in place. 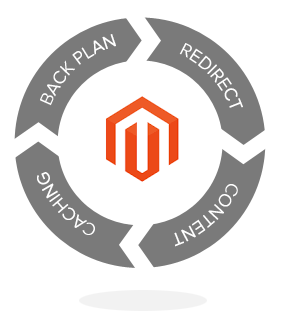 Magento has in built URL rewrite management module to handle proper 301 redirection. When you create 301 Redirect URL, it informs Google and other search engines that the requested URL has permanently moved to another URL. 301 redirection will maintain your SEO ranking and avoid losing the organic traffic. If you are having large ecommerce store, setting up manual 301 url redirection for each url is nightmare. You can easy your task by creating CSV file of all such redirection like explain here. You also need to keep watching your webmaster tool to find out all newly generate 404 errors. Keep implementing 301 redirection of all such 404 error pages. If canonical URLs are not properly set in Magento after migration, there will be lots of duplicate content issue. Controlling multiple products, categories or dynamic URLs with the same content can be difficult to handle in magento so proper implementation of canonica URL is very important at this stage. While migrating to Magento you need to setup all basic SEO perspective on magento because that helps you to avoid duplicate content and onsite SEO issues. Proper handling of canonical URL for layer navigation, product sorting and pagination prevents major duplicate content issue. You need to use some 3rd party extension from amasty or mirasvit. If you do not want to spend on 3rd party extension, you should follow this blog post for manual implementation of canonical URLs. While migrating to Magento, proper hosting is vital. If proper hosting and caching not implemented on server prior to migration, you end up with downtime. nexcess.net provides the stable, scalable and built-in Magento hosting solution so when you use this services your Magento store is ready to launch with maximum performance, stability and security. If you have large traffic on your website, implementing varnish, APC or memcache is very important. You must require well optimized dedicated managed Magento hosting with all such server level caching implanted. Our vote for such hosting goes to mgt-commerce for their awesome service. Warning: Never go with standard hosting provider like GoDaddy or Hostgator to host your Magento website. You will lose your faith from Magento. Where is your plan B? Even though you have take care of all migration needs, select proper hosting and implement proper SEO tactics but still losing your sales and organic traffic, Take brave decision of rolling back to your previous platform. Having business keeps running is more important than having website on world-class platform. Our advice here is, don’t trash your old platform for couple of months after migration. In any unfortunate events, you may need to run business from old platform. Having more than 9 years of experience with ecommerce web development, we have few advices for store owners who are ready to migrate their website to Magento. Migration is not over night job. You require pre and post migration plan. Always hire expert for migration. In efforts to save few bucks, you might end up losing your business. Setup staging server first to verify proper migration, hosting capability and SEO related settings. Consult SEO service provider to verify all your search engine related settings. Don’t focus on nice UI/UX in new platform but also think for its compatibility with old platform. Adding more features to your old platform is the aim behind migration, let the website stable after migration. When website runs smoothly on new platform, start adding new features but don’t do along with migration. Feel free to share your experience and question on this topic. We would love to hear and answers.